Triton is Neptune’s largest moon and is the only large moon in the solar system to orbit in the opposite direction to its planet’s rotation, this is known as a retrograde orbit. Triton is a frozen wonderland, exhibiting a strange array of terrain types. Its icy surface has craters, geysers, and rugged landscape called “cantaloupe terrain”. These all indicate some sort of activity going on inside, and cryovolcanism spouting material to the surface. The geysers of Triton spewing nitrogen gas out from beneath the surface into long plumes that rise as high as 8 kilometres. As a result, Triton has a very thin nitrogen atmosphere. The southern polar cap of Triton is covered with frozen nitrogen and methane. There may be a north polar cap as well. 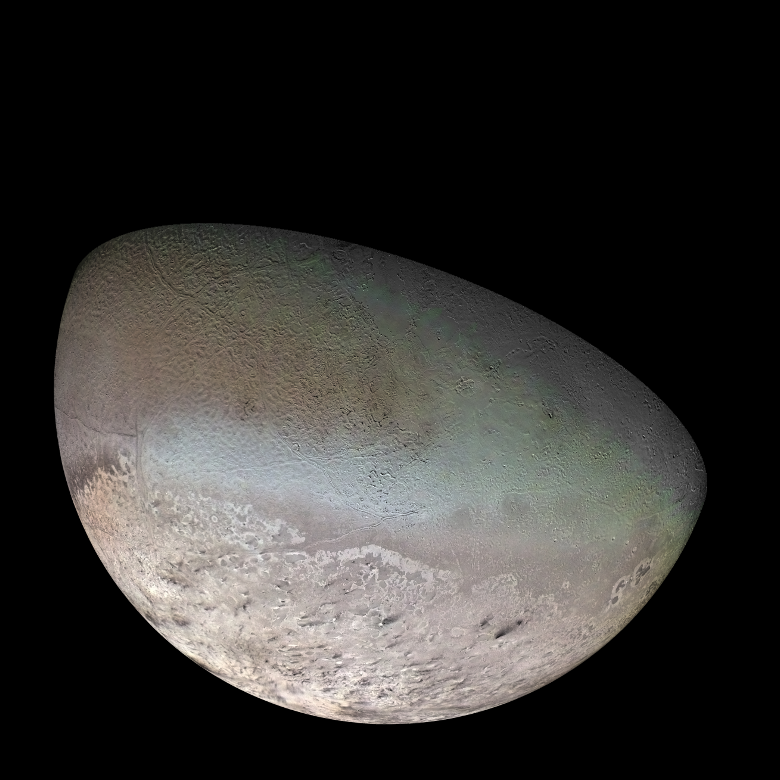 Triton could be divided into layers of ice around a rocky core. The crust is largely water ice. There could be subsurface ocean of slushy or liquid water. Triton orbits Neptune in retrograde — that is, opposite to the direction of Neptune’s rotation on its axis. This may imply that Triton was captured by Neptune’s gravity into its inclined orbit. Triton rotates once on its axis as it orbits the planet. It keeps the same face toward Neptune at all times. Triton will wander too close to Neptune in its orbit in about 3.5 billion years, and the gravitational pull of the planet will break Triton up. The result will be a ring system. Voyager 2 was the only spacecraft to visit and map Triton. It flew by in 1989. There are no other missions planned to Neptune or Triton for the foreseeable future.